Would you like to try a delicious and nutritious breakfast shake that is packed full of protein and nutrients? 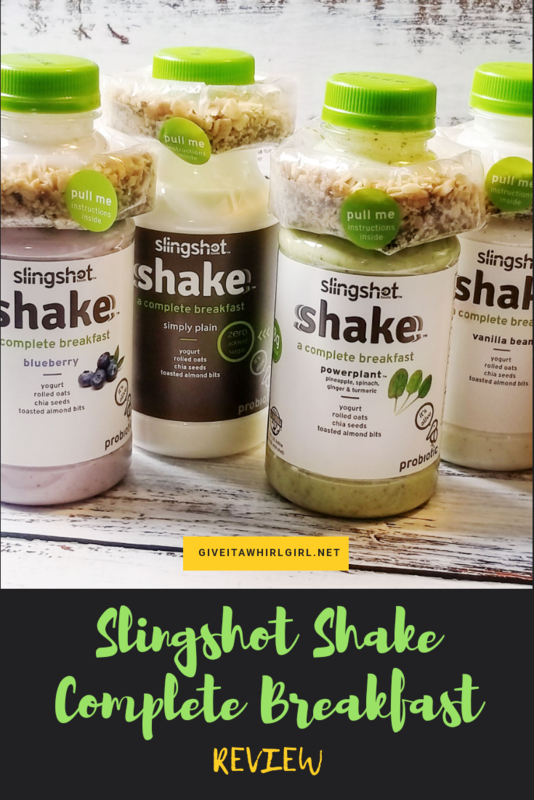 Slingshot Foods has a complete breakfast in one handy on-the-go breakfast shake and no spoon is required! What makes these Slingshot Shakes unique and stand out from the rest, is the little granola package at the top of the bottle. You simply tear it open and pour the granola mixture into your protein shake and give it a good shake to mix it up. You will find that these delicious breakfast shakes will be a lifesaver on busy mornings when you have very little or no time at all to eat. I have a feeling that after reading my Slingshot Shake review you will be stocking up on this drinkable yogurt. In today’s fast-paced world, it shouldn’t come as a surprise that drinkable yogurt is one of the fasted growing breakfast foods around. In just the past year this category of breakfast food has grown at a rate of a 20% increase. Cereal still remains the number one breakfast food (no surprise there). So just why then are these drinkable yogurts on the rise? They are an excellent source of protein and nutrients to kickstart your day. This small, on-the-go bottle of Slingshot Shake packs in a great big amount of protein to start your day. In one Slingshot Shake, you will find a whopping 18 grams of protein. This handy breakfast shake from Slingshot also contains a healthy dose of gut-boosting probiotics. A Slingshot Shake contains 15 billion CFUs of probiotics. Your gut is going to thank you for all of these probiotics. You may hear quite a bit of talk about probiotics nowadays. Probiotics are a hot topic and for good reason. Probiotics are healthy bacteria that help give your digestive system some balance between the good bacteria and bad bacteria in your gut. Lactobacillus is the probiotic that you might hear about most frequently. This good bacteria is found in your yogurt and what you might call friendly bacteria. You can read more about lactobacillus HERE. Slingshot Shake also gives your healthy diet a serving of fiber, coming in at 3 grams of fiber. Fiber is essential to a well-balanced diet and helps keep things running smoothly if you know what I mean! There are many health benefits of fiber including relieving constipation, maintaining bowel health, lowering cholesterol levels, control blood sugar levels, helping to maintain a healthy weight, and can actually help you live a longer life! The recommended daily intake of fiber for men and women vary. It is recommended that men get 38 grams of fiber, and women need around 28 grams of fiber. I checked out the nutrition label on my Slingshot Shake and was pleasantly surprised to see that these drinkable yogurt protein shakes have only all natural ingredients with nothing strange or weird lurking inside. Ingredients: (Drink) Lowfat milk, milk protein concentrate, water, organic cane sugar, honey, natural flavors, vanilla beans, lemon juice concentrate, yogurt cultures; (Shot) Toasted oats, chia seeds, almond bits, honey, sunflower oil I love when I look at the label on my food and I can pronounce all of the words that are in the list of ingredients. There are six wonderful flavors of Slingshot shakes breakfast shakes available. Each comes with its own little granola pouch. These little pouches contain the following ingredients: rolled oats, chia seeds, and toasted almond bits. The Slingshot Power Plant shake is a unique blend of pineapple, spinach, ginger, and turmeric. How can Slingshot Shakes improve? I am going to have to say that the biggest drawback to the Slingshot Shake is the amount of added sugar that I found on the label. For example, the vanilla shake 35 grams of total sugar with 23 added grams of sugar factored into that. For a health-conscious person, those 35 grams of sugar are just going to be way too much. For men, the recommended daily amount of sugar per day is 37.5 grams of sugar and for women, the recommended daily amount of sugar is 25 grams. You can find out more info about that HERE. It is super crazy hard to only take in 25 grams of sugar these days if you are a woman like me. This shake only puts me way over the recommended amount by the American Heart Association. So while I do enjoy these shakes, they are not part of my everyday morning routine. It appears to be that Slingshot Shakes will be soon releasing a line of drinkable yogurt shakes for your little ones. The Slingshot Shorties, however, do not come up with the crunchy shot of granola for the shake. Slingshot Shakes decided that it is a textural issue with young children. The shakes for your little ones will still be full of nutrients and gut boosting probiotics, but no shot. Slingshot Shakes are a simple and easy solution for when you need a quick breakfast. Just grab and go! The crunchy granola shot was a nice welcomed addition. The granola shot gives this yogurt shake a delightful texture. My daugher, who is 9, also enjoyed drinking the Slingshot Shake. I was happy to share with her and it is a breakfast that I feel good about serving. Question Time! What flavor of Slingshot Shake will you be giving a whirl first? Leave me a comment and let me know what flavor you will try! Want to learn more about Slingshot Shake breakfast shakes? Use the STORE LOCATOR to find out where you can get your SlingShot drinkable yogurt. This entry was posted in Product Reviews and tagged almonds, breakfast, chia seeds, drink, fiber, gluten free, granola, healthy breakfast, healthy eating, healthy food, oats, probiotics, protein, review, shake, Slingshot Shake, yogurt. Bookmark the permalink. I’ve never heard of Slingshot Shakes but it sounds interesting and something I’d like to try. I like the added granola into the shake too. I think the Peach or the Strawberry sounds really good to me! Well, I’d love to try them, but I have PCOS and so I can’t eat things with this much added sugar! 🙁 I do love yogurt though.